The KPMG report, the marketing of 80 DeKalb, and Forest City Ratner's deceptive promises about AY "housing for Brooklyn"
Forest City Ratner has tried very hard to suggest that the mixed-income housing in the Atlantic Yards project would be "for Brooklyn." 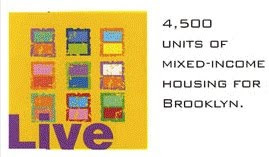 A May 2004 brochure, the very first "liar flier," promised 4,500 UNITS OF MIXED-INCOME HOUSING FOR BROOKLYN. The only problem: market-rate housing follows the market, natch, so renters and buyers come from anywhere. Although any new and upscale development in Brooklyn that offers transportation benefits similar to the Subject Property will likely attract residents from within New York City as well as the suburbs, a significant number of residents will likely come from Manhattan and to a lesser extent Brooklyn. Those from Brooklyn will likely involve "move-up" residents. Keep in mind that 450 units of the 2250 subsidized units would be close to the top of the market, while another 450 would be well over the minimum. 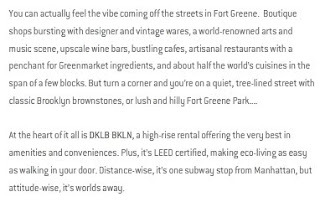 Also, FCR's marketing for the 80 DeKalb Avenue tower in Fort Greene, which the developer considers a test run for the AY market-rate units, seems geared to introducing Manhattanites and others relocating to Brooklyn to a chic neighborhood. While half of the 2250 subsidized AY units would be reserved for residents of the three Community Board districts encompassing the project site, the rest would be distributed via lottery. And the 2250 market-rate rentals and 1930 (as of now) condos would be available to those willing to pay the freight. In an 11/06/05 New York Times article, published after I and others had pointed out how office space had been traded for condos, Forest City Ratner officials claimed they were "already contemplating adding 1,500 condominium units, in part because community leaders had pushed Mr. Ratner to include more housing in the project"--though, as I pointed out, ACORN certainly didn't want more market-rate housing. 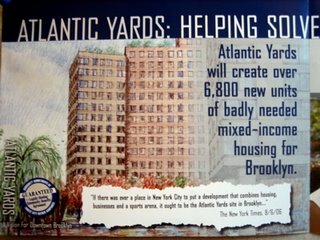 Atlantic Yards will create over 6,800 units of badly needed mixed-income housing for Brooklyn. Again, there's no reason to believe that most of the housing would be "for Brooklyn," for established Brooklyites, or somehow contributing to a mythic borough tax collection agency. It's just rhetoric, part of the endless "Brooklyn" invocations practiced by Borough President Marty Markowitz and other project supporters. Forest City Ratner sees its 80 DeKalb tower, which would include 80% market-rate units and 20% low-income units, as a test run for the market rate housing planned for Atlantic Yards. As I wrote after the second and final community forum (aka extension of public hearing) in September 2006, though there had been much testimony about the 2250 units of affordable housing, nobody spoke for the unmentioned 4610 (as of now) households that would move into the market-rate rentals and condos. Now we have some clues. 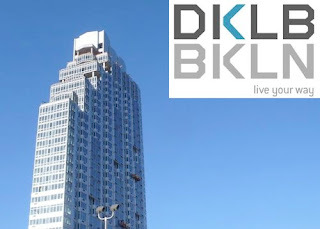 At the heart of it all is DKLB BKLN, a high-rise rental offering the very best in amenities and conveniences. Plus, it's LEED certified, making eco-living as easy as walking in your door. Distance-wise, it's one subway stop from Manhattan, but attitude-wise, it's world away. Conspicuously missing: any indication that the tower would be close to the planned Atlantic Yards arena. From the community forum: "You're not from Fort Greene"
So, I'll remind newcomers to Fort Greene what Carpenters Union leader John Holt Sr. said at that community forum, asserting that Atlantic Yards was about "the haves and the have-nots," and suggesting a lack of Fort Greene authenticity among anyone who dared to question the project. What he might say to the newcomer renting at 80 DeKalb? MR. JOHN HOLT: My name is John William Holt, Sr., Thomasina (phonetic) Holt's baby boy. I am from Fort Greene. I remember Fort Greene from a long time ago from Jay Street to Broadway when the train used to run over my head. It was traffic then. We knew about this Ratner project for years. MR. JOHN HOLT: -- you understand what I'm saying? MR. JOHN HOLT: I am the Executive Delegate for the Carpenters Union and I also speak for them. This is about the have and the have-nots. This is a classification thing, that's all this is. We didn't ask you to come to Fort Greene, okay, Fort Greene has been this way for the longest, all right. MR. JOHN HOLT: If you didn't play hot peas and butter, you not from Fort Greene, you just moved here, okay; If you didn't play red rover, red rover, send Forest Ratner over, you understand what I'm saying, you're not from Fort Greene. I'm from Fort Greene. I remember when we used to have the Fox Theatre, okay. I remember when we had the Paramount. I remember when I couldn't go into Juniors. But it's a different day now, I can walk into Juniors and eat anything I want in there because of the unions. Now, I can show you a big thing and you will protest until the days go long. But I can show you little, lot of things that they're building around here and you won't say nothing, nothing at all, nothing. MR. JOHN HOLT: There's a lot of little things that's going on. Like a fair days' wages for our union brothers and sisters, okay. MR. JOHN HOLT: We're not illegal aliens. We pay our taxes and all we want is to send our children to school. We don't want to see them in jail. Our children go to the same school that we live in, not private school like you people who live here, okay? We don't have nannies, okay. MR. JOHN HOLT: We don't have nannies. We don't have people coming in to clean our houses. And if they did, we won't be like you people and pay taxes on them. And we would give them a fair wage because that's what we believe in. I once heard a great general say, man cannot live without war. Well, my philosophy is - and I've been preaching it since I've gotten into the unit - we cannot live if we do not build. If we do not build, my philosophy is we will die. THE PRESIDING OFFICER: Twenty seconds. MR. JOHN HOLT: -- the people from Fort Greene because they deserve something nice, they deserve to be part of it, okay. I am for the stadium, for the men and hard women that come into our business. THE PRESIDING OFFICER: Time is up. MR. JOHN HOLT:-- a minority, I'm colored, all right. I'm black. MR. JOHN HOLT: We build careers. MR. JOHN HOLT: Thank you.